The tag clarification seems to be useless. The tag has also no tag wiki. With 45 questions only, the burnination should not be problematic. In my opinion, this tag has no real use. It is ambiguous at best and a meta tag at worst. Should we destroy it kill it with fire? Edit: After almost one week there was no disagreement with this request. If nobody complains within the next approx. two days, I will start removing the tag. The name is (ironically) unclear, and very likely to be misused by inexperienced askers who are (like many askers) seeking "clarification" on some issue. That's obviously a bad use of the tag. This use being so widespread, and natural enough given the tag name, makes the tag not worth keeping around just for some posts which are somehow about clarifications, e.g. clarifications to UI or clarification requests on posts. 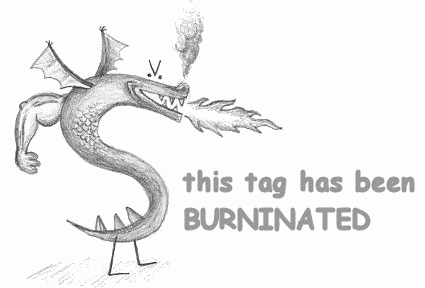 This tag has been burninated! Users will no longer be able to ask for clarification. Thanks to everyone who helped removing this tag! In the process of removing the tag, I propose to tag questions having issue with language with language-usage. There are cases that the language usage can be interpreted differently by different people, therefore require the OPs to ask for... clarification. For example, in the question Clarification on the new Quorum and Convention badges, the OP has trouble with the word "post", so they need a clarification. Not the answer you're looking for? Browse other questions tagged discussion status-completed meta burninate-request meta-tags . 'Calculation' tag: merge, burninate, or leave alone?